Senator Hillary Clinton has long been a target for distortion, despite her outstanding record on issues ranging from education, to health care, to support for Israel. Despite her strong commitment to Israel and close kinship with the Jewish Community (a key reason she is tremendously popular with her New York constituents), right wing smears against her leadership continue. Giuliani advisor Martin Kramer, for instance, wrote a disingenuous piece in the Jerusalem Post claiming that Senator Clinton’s rhetoric on Israel contains code words hinting that she is not really a true friend of Israel. Of course there was no logic to anything he wrote, not a surprise given that Senator Clinton has worked overtime in support of Israel in the Senate. 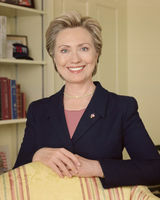 Before delving into the specific charges offered by Kramer, it is important to note that Senator Clinton has been a great supporter of Israel throughout her career, and is one of Israel's strongest friends in the US Senate. She led the charge for Red Cross recognition of Magen David Adom and has an impeccable voting record. If Hillary were but a fair weather friend of Israel, as Kramer suggests, she surely would not enjoy the immense popularity she has seen in New York. One simply does not get re-elected in the Empire State with 67% of the vote if there is even a smidgeon of legitimate doubt about one's support for Israel. Here is what the Orthodox newspaper, The Jewish Press, which opposed Clinton in 2000, wrote in support of her candidacy for re-election to the Senate in 2006: "As regards Israel, she has become an important supporter of the Jewish state both in public and, perhaps more importantly, behind the scenes. She is held in the highest regard by those who regularly plead Israel's cause in the halls of government. For those who initially were wary of her positions on Middle East issues - and we include ourselves in that category - Ms. Clinton has proved to be a pleasant and welcome surprise." The Senator’s Israel position paper states, "from her first trip to Israel on New Year’s Day in 1982 through her years as a U.S. Senator, Hillary Clinton has a long history of strong and steadfast leadership for the US-Israel relationship. Her connection to the State of Israel, which began when as the First Lady of Arkansas, she brought an innovative Israeli preschool education program to her state, has grown." It goes on to say that "Hillary recognizes that Israel is a most important strategic ally against the scourge of terrorism and radicalism. ‘Israel,’ she said, ‘is not only a friend and ally for us; it is a beacon of what democracy can and should be.’"
Time and again, Senator Clinton comes forward to stand with Israel. In September, for instance, Senator Clinton voiced strong and eloquent support of Israel’s decision to take out a Syrian weapons facility in September, asserting that "the Syrians apparently were putting together, and perhaps over some period of years, a nuclear facility, and the Israelis took it out," adding, "I strongly support that." In a further example, Senator Clinton’s office teamed with Palestinian Media Watch in February 2007 to release a study of anti-Israel language in Palestinian textbooks. Bold actions in support of Israel are the rule from Senator Clinton’s office, not the exception. And, as was previously alluded to, Senator Clinton was a leader in the successful efforts to push for recognition of Magen David Adom (Israel’s Red Cross) into the International Red Cross movement, leading American Red Cross Chairwoman Bonnie McElveen-Hunter to comment: "In partnership with the American Red Cross, Senator Clinton has been a strong and engaged leader in support of Magen David Adom’s acceptance into the International Red Cross and Red Crescent Movement." Of course, it is important to remind anyone tempted to believe the right wing’s rhetoric about Senator Clinton that her husband’s administration was strongly supportive of Israel. To this day, former President Clinton continues to speak out on behalf of the U.S.-Israel relationship, notably taking former President Jimmy Carter to task for falsehoods in his book about the Middle East. Ira N. Forman is Executive Director of the National Jewish Democratic Council. The NJDC does not endorse in primaries and does not have a preference between Senator Clinton and Senator Obama.